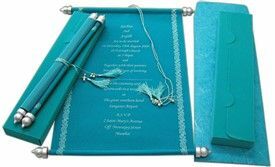 We, Indian wedding cards stores, offer you a wide range on wedding invitation cards which are elegant in look and reasonable at the same time. 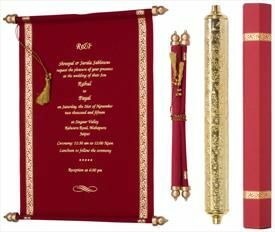 If you are looking for a card that has rich, royal and unique look then Scroll Wedding Invitation card is the perfect choice. The lifestyle of kings and queens have always fascinated people, there is always a level of aura, mystery and sophistication in everything that is related to them. Our designers scroll cards recreates the magic and splendor that will leave everyone enthralled. “Wedding” is once in lifetime occasion and nothing can match the magnificence then our royal cards. Shop from our exclusive range of Scroll invitation cards that will not only make your guest feel happy and privileged, but will also leave an enduring impression on everyone. We present to you an exotic selection of miniature scroll invitation cards which are just apt for your smaller text needs. 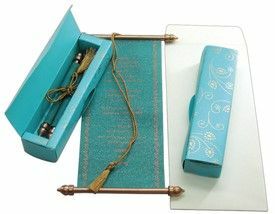 These beautiful mini scroll cards are handcrafted and are available in attractive colors and stunning designs. Our exclusive range of Box scroll cards is available in a variety of colors and ethnic pattern prints. These cards are complimented with attractive boxes that can be a hard box, a flat box or can even be customized according to your personal preference. These cards are specially designed for royal weddings and celebrations. 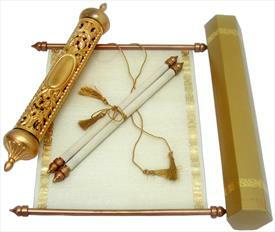 High end scrolls are fabulously crafted and can be referred as the king of all scrolls. 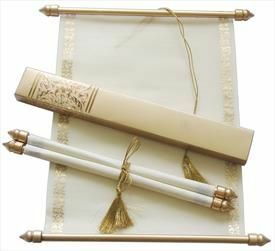 Come and explore our magnificent assortment of high end scrolls that are available in awesome color combination and will undoubtedly leave your guest spellbound. This range of cards comes without a box. These are available in classic designs and traditional print patterns. Pick from our exclusively designed only scroll cards that come with or without an envelope. The beauty of these cards can be enhanced by using rich border and Kundan work. We specialize in manufacturing a wide selection of classic Fabric scroll cards. 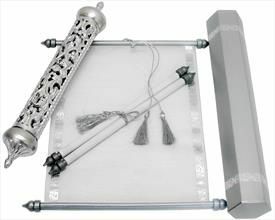 These are marvelously crafted using high quality fabric like silk or satin with beautiful design bars on the borders. Superbly designed using exotic embroidery, Zari work and beautiful ribbon for fastening gives it a truly royal and rick look. Planning for a Cinderella theme wedding? 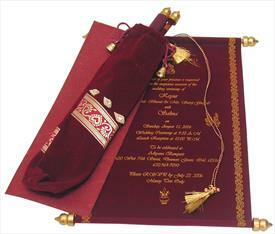 Then, Indian wedding cards are the apt choice for you to select from a huge range of eye catching Theme scroll cards. We have expertise in designing theme based cards that are decorated with loads of sparkle and glitter for a majestic fairytale wedding.